To ask other readers questions about All the Names They Used for God, please sign up. Over the past few months, I've picked up a number of short story collections and this one happens to be one of the least memorable. There are only nine stories in All the Names They Used for God but several made me think "huh?" and not a single one really stood out to me. I can almost always pick out at least one or two gems in a collection but all left me fairly cold here. It's somewhat odd that these stories were lumped together into a collection at all. There's nothing really tying them togeth Over the past few months, I've picked up a number of short story collections and this one happens to be one of the least memorable. It's somewhat odd that these stories were lumped together into a collection at all. There's nothing really tying them together - no overarching theme or link that unites them. Instead, they are a series of strange, dreamy snapshots of completely different times and places. One story follows a man post-breakup, as he goes on a wilderness retreat date with someone new; another, "Glass Lung", follows a Danish man after he inhales glass shards during a steel mill incident and, rendered disabled and hardly able to speak, later finds himself uncovering a hidden tomb in Egypt. To say the stories are random would be an understatement. I also really understand the use of "dreamlike" and "dreamy" to describe this collection. In fact, they do sort of all feel like dream sequences and, like when someone else feels the need to share their weird dreams with you, they didn’t feel real or tense or emotional. I did not feel drawn into any of the worlds or compelled to care about any of the characters. Some of the concepts were interesting, but a story must be more than its concept to impress me. If you're looking for hard-hitting, emotional short stories, try What It Means When a Man Falls from the Sky instead. 3.5 When I am reading s book of short stories, I usually jot down a few details about each story, as a memory aid. I do not, however, look at these notes unless I absolutely have to, rather trying to see how much I remember just from the story titles. A good way for me to gauge how memorable and note Worthy is each story. After finishing this well written collection I am happy to say I remembered quite a few. They run the gamut from the past to the future, each one full of characters trying to es 3.5 When I am reading s book of short stories, I usually jot down a few details about each story, as a memory aid. I do not, however, look at these notes unless I absolutely have to, rather trying to see how much I remember just from the story titles. A good way for me to gauge how memorable and note Worthy is each story. After finishing this well written collection I am happy to say I remembered quite a few. They run the gamut from the past to the future, each one full of characters trying to escape their fate. Nature, science, religion all themes represented. Loved the first story, The world by Night, the character Sadie and her strange fascination with a cave. Not sure I fully understood the end, but loved getting there, trying on my own interpretation. Enjoyed Robert Greenman and the mermaid, a mermaid story with a twist. The title story is also memorable, two young girls kidnapped by soldiers who discover they have a secret power that serves them years later. My very favorite though was the last one, Pleiades, seven sisters who were born threw scientific experimentation, and the tragedy that ensues. All in all, a marvelous and interesting collection of shorts. Anjali Sachdeva has written a diverse, compelling and strong debut collection of stories. I can't think of any other collection I've read that is this eclectic—there are stories about genetically perfected septuplets, a man with glass lungs, John Milton writing his epic poem, weird blobby aliens who take over earth and witchy women who put men under their spells. It's bizarre and fun and emotional and quite wonderful. 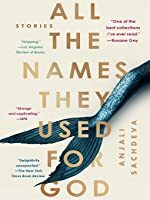 I think this would be a great collection for people who don't read short stori Anjali Sachdeva has written a diverse, compelling and strong debut collection of stories. I can't think of any other collection I've read that is this eclectic—there are stories about genetically perfected septuplets, a man with glass lungs, John Milton writing his epic poem, weird blobby aliens who take over earth and witchy women who put men under their spells. It's bizarre and fun and emotional and quite wonderful. I think this would be a great collection for people who don't read short stories that often because there's bound to be one you'll like. And if you like one, you will probably like them all since her writing consistently delivers. "Wonder and terror meet at the horizon, and we walk the knife-edge between them." These words end the introduction to this powerful, haunting collection of short stories. Sachdeva explains in her introduction that in old times people knew better than to trust their gods. "Gods" enter these stories in unexpected, sometimes wondrous and sometimes terrifying ways. I put "gods" in quotations because what enters into these stories is never called god or what is expected of god, but instead is a f "Wonder and terror meet at the horizon, and we walk the knife-edge between them." These words end the introduction to this powerful, haunting collection of short stories. Sachdeva explains in her introduction that in old times people knew better than to trust their gods. "Gods" enter these stories in unexpected, sometimes wondrous and sometimes terrifying ways. I put "gods" in quotations because what enters into these stories is never called god or what is expected of god, but instead is a force, a magical entity, something otherworldly that is hard to put a name to. Sachdeva's stories take place in many locations around the globe and at many different time periods, some past, others present and one in a horrific dystopian future. Sometimes this magical presence offers harm or mischief into the character's life and at other times it offers comfort, but most often both occur. Even when this magical entity is helping the characters out of a horrible situation, there is a terrible flip side to it. For example, the young women kidnapped in Abuja are able to fool their captors by looking into their eyes and hypnotizing them. They continue to use this skill in their lives as they evade not only their captors, but to their advantage to steal from others. And on a deeper level, even though they have escaped their captors, they can never return home as the innocent young girls they were. They have irrevocably changed. In another story, a newly-wed fisherman becomes enamored of the mermaid he encounters off the coast of Newfoundland. However, as his enamorment of the mermaid grows, the rest of the world fades in beauty and interest for him. Now, this mermaid is in love with a giant great white shark and sings to bring fish to the shark so he will be well fed and not wish to eat her. This makes the fisherman extremely successful when fishing in these parts, however, there is an extremely disturbing development when tropical fish begin to fill their nets. These stories are deep and convoluted. They force the reader to ponder serious questions. There are dark mysterious forces at work within these stories, but such ethereal beauty as well. I thought these stories were incredibly well conceived and executed. There is something unnerving and unsettling about them that touches upon something real that is hard to put into words. The title is so appropriate because there is so much we cannot quite perfectly describe but feel, and many ascribe it to Gods or higher being. I would highly recommend reading this! A difficult book to review. 2. Robert Greenman and the Mermaid - a fisherman who thought he was happy with life meets a mermaid. Themes of happiness, wonder, death, prey and predator relationships etc. 3. Anything You Might Want - well written; about futility of human relationships and the need to A difficult book to review. 3. Anything You Might Want - well written; about futility of human relationships and the need to freedom from other people. Glass Lung (A man who inhales shards of glass and then accompanies his daughter and the man she fancies to Egypt on an archaeological excavation) , All the names they used for god (Girls kidnapped by jihadists and how it damages them), Killer of Kings (angels being muses to artists), Manus (a futuristic world where alien-like beings exist and humans have to give up their hands for metal appendages and be 'forked') and Pleiades (7 sisters made scientifically by parents who are geneticists and the challenges they face). There are a few other stories in the collection as well. Most stories were not memorable. I love magical aspects in stories but they were either too subtle or not definitive enough for me. At the end I always felt there was something 'missing'. Also, I am unsure if there is a common theme that threads these stories together or they are individual ones meant to enjoyed one at a time. I'd recommend the book for the writing because Sachdeva really knows her craft, but not necessarily as a short story collection to enjoy. That said, I definitely think she is a writer to watch out for. This has to be the best short story collection I have read. There was just enough fantastical elements that it felt somewhat realistic, and the satire was subtle but there in each story but never took away from the entertainment of the stories. All the Names for God (the short story in this) was amazing and I found myself thinking about it long after I read it. The World by Night - 5 stars - I was on edge the whole time I read this trying to figure out how this was going This has to be the best short story collection I have read. There was just enough fantastical elements that it felt somewhat realistic, and the satire was subtle but there in each story but never took away from the entertainment of the stories. The World by Night - 5 stars - I was on edge the whole time I read this trying to figure out how this was going to end. It's dark and wondrous and takes place in a cave. You can feel the hope and hopelessness all at once somehow. Glass-Lung - 4 stars - This was a complex story about a family, hope for treasure, and the wonders of the world and the strange things that can happen. I loved the father in this. Logging Lake - 3 stars - not sure of the overall point of this, a camping trip that turns strange and a relationship that is based around how interesting one person is. Killer of Kings - 3 stars - I liked the overall concept of angels being muses for artists and their jobs aren't done till the artist has completed their work. Ending was interesting but left me slightly confused. All the Names for God - 5 stars fantastic! - women escaping awful fates and accepting the things they went through and who they have become. About how others want them to be damaged but they are okay as they are. Robert Greenman and the Mermaid - 4 star - about a lone mermaid and a fisherman who thought he was happy with life. How the world is filled with wonder and once you realize that, you become unsettled. Anything You Might Want - 5 stars - about getting what you want in relationships (all relationships) when you need them. The importance of freedom from other people. Manus - 4 stars - a futuristic world where alien-like beings have come and integrated themselves into human life, and over time they take the humans' hands. Seems small until you consider how important hands are and the sense of touch and really hit harder than I expected. 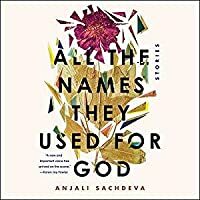 All the Names They Used for God, Anjali Sachdeva’s debut release, is a stellar collection of short stories that explores the strangeness that is the human experience and our small stature in the vastness of the cosmos. Rewards abound for the short story lover: science gone awry in “Pleiades”; abandonment and love gone wrong in “Anything You Might Want”; man versus wild (and the call of suicide) in “Logging Lake.” These are intricate, spinning tales that took me off guard. Does this collection have a theme? I don’t know. Perhaps spirituality is the link (and there is the title to be considered); these stories do ponder the concept of a God and how much say he — or it — has over our lives . . . and how much of what happens to us is pure chance. Bits of magical realism abound (see mermaid tale “Robert Greenman and the Mermaid”), but overall these tales are unwavering, realistic looks at the human condition. I was pleasantly surprised by these stories. I suspected I would like this collection, but I was knocked for a loop. Compelling and challenging in equal measure, this author is one to watch. I await her next release with baited breath. ALL THE NAMES THEY USED FOR GOD is a collection of short literary fiction stories, the last two of which were absolutely brilliant. The tales in this book are all over the place, but I think it's all the different facets of humanity that link them all together. No two stories here are even remotely alike and I enjoyed that diversity. LOGGING LAKE which involved a strange happening at an ill advised campsite. ALL THE NAMES THEY USED FOR GOD which was a heartbreaking story ALL THE NAMES THEY USED FOR GOD is a collection of short literary fiction stories, the last two of which were absolutely brilliant. ALL THE NAMES THEY USED FOR GOD which was a heartbreaking story of two young girls who were kidnapped and forever changed by it. ROBERT GREENMAN AND THE MERMAID: Once we glimpse something fantastic,(in the true sense of the word), it is very difficult to let it go. MANUS was probably my favorite story here. After so many tales involving ordinary life, here's one that is totally out of left field. Gripping, poignant, and so creative-I'll never look at a human hand in the same way again. And finally, PLEIADES. I don't even know what to say about this story. It's powerful, beautifully written and well told. I doubt anyone could read it and remain unmoved. I liked the tales in this collection, but until the last two I didn't feel that this volume was anything special. MANUS and PLEIADES elevated this book to something really special in my eyes, and I highly recommend this book to fans of literary and speculative fiction. If you’re wondering what’s the deal with the “God” in the title and how it related to each story individually, think Neil Gaiman’s American Gods , where the old gods/beliefs of the immigrants coming to America are replaced by the new ones born out of humans' obsessions with media, technology and celebrity. For a debut short story collection, All the Names They Used for God has quite a few gems! Beautifully written and masterfully crafted stories where the characters sprung alive in just a few short pages, but once again, I realize that the short story form is not for me. I utterly enjoyed the stories, all of them, they were captivating and unpredictable, but then they simply... ended. I know this is kind of the whole idea, but it totally left me with a vague sense of wanting more. Still, a lovely book, I'm glad I had the chance to read it. With this title, I was expecting a novel about the horrors that have been committed in the name of God, such as the Spanish Inquisition. But the title is misleading. The stories are more about the concept of how we see God or any power that can change our lives. This stellar collection is exploring humanity’s strangeness. The stories read as ominous and compelling fiction that I would call magical realism. The author, Anjali Sachdeva, is ridiculously creative in writing unusual and dark tales. After each story, I thought “How bizarre.” Still, after each story, I felt that the author hit a nerve, making the plot acceptable, even moving. The title story presents stirring images of Nigerian schoolgirls who are kidnapped by jihadists. The story goes back and forth between the time they are abducted till they are adult women. It is so darn sad. As adults, they gain some sort of mystical power over the men who abducted them and they are no longer being abused. But it is too late. They have been beaten and raped too many times over the years. They no longer feel human. It leaves the reader wondering what is left when one survives the un-survivable. This story made me simultaneously think: Is surviving even worth it when the cost is that you lose your soul? And, hoping that in real life, battered women are able to find a way to leave their abusers and still keep their human core. Dave Eggers, who wrote the best selling non-fiction “A Heartbreaking Work of Staggering Genius” said Sachdeva’s short story “Pleiades” is “a masterpiece.” Indeed, it is one of my favorites in this collection of heartbreaking stories. This one is about a couple who are geneticists. Ignoring the protesters holding signs that read “Seven Deadly Sins” and “Frankenstein’s Children,” they produce seven test-tube sisters that grow to become loving and inseparable. Unfortunately, over their childhood, teens, and womanhood they are all ill-fated. Making the reader either hate or sympathize with the grieving parents. I kept going back and forth thinking that they were thoughtless parents-to-be, thinking only of their careers. Then to wondering that they were no different from other loving parents-to-be who also happened to be trailblazing scientists. In “Robert Greenman and the Mermaid,” there is a fisherman, a mermaid, and a shark. Of course, the fisherman is bewitched by the mermaid. What makes this story so original is the shark. The mermaid loves to watch the big fish feed on its prey. She feels that the shark represents all that is beautiful in the deep sea. The fisherman wants nothing more than to escape or kill the twenty-foot long hunter. It is a sweet sad story leaving you to ponder why humans are so afraid of anything different from themselves. The story that creeped me out the most and haunts me still is “Manus.” In this story, aliens replace human hands with metal appendages. This neatly sums up this story, but without producing the Heebie Jeebies feeling. The aliens are called The Masters. The story begins with a couple looking at their neighbor when he is opening his mail and begins to cry. He’s just received his draft card. In this story, getting a draft card means that within two weeks, you must go for an “Exchange Apparatus,” known to humans as the “Forker.” For the surgery, the human holds out their hands and inserts them into pneumatic cuffs that shut around their wrists. After removing, the hands are replaced with metal fingers that look like forks. Ugh. When it is time for the man in the couple to be forked, I actually wept for him. When it is his girlfriend’s turn, she rebels. She does not get forked. However, to keep her body metal free she self-mutilates. Leaving her body just as gross (I won’t explain more so you can be just as shocked as I was) as if she was forked, shades of the title story, was it worth it? Sachdeva is clearly talented in her craft. I usually do not care for the genre magical realism, but this author makes me realize that the genre is about the human condition and how we are conditioned to feel. I so enjoyed the book, “Love in the Time of Cholera,” by Gabriel Garcia Marquez, which I am now guessing is magical realism. I suspect this reviewer must examine the genre more carefully. Nevertheless, there are other stories in the collection also showing the damaging results of abusive power. All the stories in this collection have a unique and thought-provoking prose. Just know that she also writes like Rod Serling on an acid trip. I received this novel from the publisher at no cost in exchange for an honest review. This debut collection is tender, dark, at times bizarre, and compelling. My absolute favorite is Pleiades, and the story has remained with me for days. I wish the author would use her magic and turn the story about the daughters of geneticists, the sisters so terribly alike and ill fated and turn it into a full novel. But that’s just me being greedy, I can only hope she has a full novel knocking about in her brain, ready to give birth to that I can devour one day. It somehow tickled and horrified me, broke my heart and then kicked my spirit some more. All the stories in the collection are clever and strange. I keep imagining my fingers as forks. I also stepped into the shoes of a wealthy girl, hungry to get the hell out and fall in bad love. In Logging Lake, it’s the terror of disappearances and never knowing. It’s eerie, the unknown is a black hole, it’s a madness, it’s the question that can never be solved. In Glass Lung a worker in Carnegie’s steel mill is injured in a freak accident that alters he and his daughter Effie’s future. There is the hunt for something amazing, and the terror of everything you’ve done, all the sacrifice amounting to nothing. It’s angels as muses, a girl as white as snow burying her dead parents, who finds a husband despite her cursed looks and then descends into a secret dark place beneath the surface of her land. The stories are unusual, and at times there is something ominous threatening just in the periphery of the characters vision. It’s terrible, and lovely. This is an author I’ll be watching, hoping for a full novel! Add it to your reading list for 2018! 4 stars? 5 stars? I'm not sure! I enjoyed everyone of these stories, but I LOVED LOVED LOVED several of them. My favorites were All The Names For God, The World At Night, Logging Lake, and Robert Greenman and the Mermaid. If you can, get your hands on this collection! This collection provided everything I look for in a short story: a world that draws me in at once, and a character who takes me on a journey. With each story, we experience a transformation. The writing is what I'd call speculative fiction, but it's incredibly seamless. Every world the author creates feels like it could exist alongside our own. Sometimes the story's place in time is clear (e.g. Carnegie's steel mills). Sometimes it feels like it could be pre-industrial or post-apocalyptic. Interesting and dreamlike yet still somehow left me wanting more (even for short stories). The author clearly is tremendously talented, and there are scenes from several of the stories that will stay with me. Utterly captivating collection of short stories in diverse settings. Haunting and surreal. A thoroughly enjoyable read. Favourites are 'The World by Night', 'Glass-Lung', 'Robert Geenan and the Mermaid', 'Manus' and 'Pleiades'. Bravo! 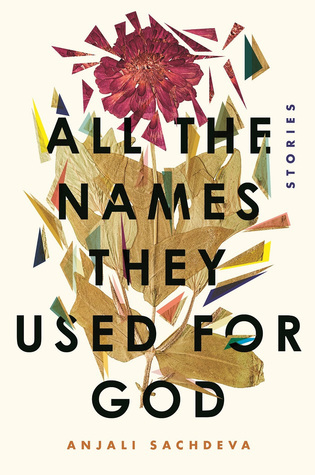 “All the Names They Used For God” is a short story collection of 9 stories and the majority of these were very moving and beautifully told. I personally love strange stories. The stories that have that element of something extra that can’t really be explained, but can funny enough be relatable to ordinary life. About 5 of the 9 short stories did this and I absolutely loved them! The collection opens with a lonely woman who discovers a cave in her backyard and the place she discovers underneath the ground, next we have a man who works in a mill when one day an explosion goes off causing glass shards to enter his lungs from a scientific discovery of a glass object that was made by lightning hitting an Egyptian desert, the stories continue with a recent single man who finds a woman on a dating site and they go hiking together in the mountains and she oddly disappears, then my personal favorite of the collection: “Robert Greenwood and the Mermaid” weaves a romantic story of life at sea and a mysterious find, to wrap up Sachdeva tells a unique moving tale of septuplets. Though I would have wished all these stories would of had an easier connection to each other, I do feel the author tried to show all these characters had a similar life: one of isolation and loneliness. Overall, I really enjoyed this and I feel like some of these stories are worth coming back to and re-reading and possibly deciphering more of their beautiful context. This book is a collection of nine short stories each belongs to different genres with the open-ended climax, All of these stories left you with the question mark----what happened next? or this is what I felt after reading the book. The title story "All the Names They Used For God" is a tragic and brave tale of two Christian Nigerian girls kidnapped by Boko Haram and their brave attempt to break themselves free from the forced believes and extremist views. My favorite from the collection is "the Pl This book is a collection of nine short stories each belongs to different genres with the open-ended climax, All of these stories left you with the question mark----what happened next? or this is what I felt after reading the book. My favorite from the collection is "the Pleiades", "Manus" and "Logging Lake", all of these stories belong to different genres and told the equally different and grasping tale. "Pleiades" is story middle-aged couple and their seven identical girls, whom they have kind of manufactured to be identical with help of scientific advancements, the story gets dark when girls started to die one by one. "Manus" is the story where aliens took hold of the earth and planned to replace everyone's hands with fork tines and a rebelling against them. "Logging Lake" on the other hand is a story of romantic Longing and the confusion of human relation. I overall liked the collection and would recommend to a person who liked to read all kind of genres. Another great collection of short stories, and each one is enigmatic, exciting and offers a slice of adventure and mystery. Could it be? Do I..... LOVE SHORT STORY COLLECTIONS? This is a recent development for me. A woman with light sensitivity finds Could it be? Do I..... LOVE SHORT STORY COLLECTIONS? This is a recent development for me. A woman with light sensitivity finds a new sense of belonging lost in caves. An ambitious man finds his life halted by an explosion of vaporized glass. A poet sees something more human than angel in the divine muse sent to assist him. A young woman, one of septuplets born from genetic engineering, is haunted by her eventual demise as her sisters die one by one. I devoured this collection, and am looking forward to reading more from Sachdeva. “Wonder and terror meet at the horizon, and we walk the knife-edge between them.” These are the words you are left with at the end of the introduction to this stunning collection of short stories. In the introduction Sachdeva explains her inspiration for the collection deriving from how people in the past knew better than to trust their “gods”. Notice gods is in quotations. In these stories there are no traditional gods. There are otherworldly forces and magical entities that act upon the charac “Wonder and terror meet at the horizon, and we walk the knife-edge between them.” These are the words you are left with at the end of the introduction to this stunning collection of short stories. In the introduction Sachdeva explains her inspiration for the collection deriving from how people in the past knew better than to trust their “gods”. Notice gods is in quotations. In these stories there are no traditional gods. There are otherworldly forces and magical entities that act upon the characters in these stories. These stories take place all across the globe and during different time periods; past, present, and future. The magical entities that enter these people’s lives offer both harm and comfort. There is usually a balance of good and bad within each situation. Every action elicits a consequence. Well, color me impressed. This was such a wonderful debut collection! Though I didn’t love all the stories equally, the entire collection held my interest the whole time, which is more than I can say for most collections that I read. Sachdeva has such control over her prose, which is vivid and dreamy, but not excessively so. Plus, there’s such a diversity of stories here in terms of character and setting and subject matter, but they're all so tonally and thematically resonant that none seem out Well, color me impressed. This was such a wonderful debut collection! Though I didn’t love all the stories equally, the entire collection held my interest the whole time, which is more than I can say for most collections that I read. Sachdeva has such control over her prose, which is vivid and dreamy, but not excessively so. Plus, there’s such a diversity of stories here in terms of character and setting and subject matter, but they're all so tonally and thematically resonant that none seem out of place. There are strange caves and mermaids and angels and glass lungs, tales about dystopia and genetic engineering and witchcraft; I’m pretty sure anyone who reads this would enjoy at least one of these stories. My favorites were “Killer of Kings,” “Robert Greenman and the Mermaid,” and “Pleiades,” but “Manus” also blew my mind a bit. That being said, I found all of the stories here very interesting, except perhaps “Anything You Might Want” which I consider the least memorable of the bunch. I often find that in a collection there are more stories I felt were “meh” than stories that compelled me, so this really is a feat. The one criticism I have isn't a major one, but I wish there was more diversity in terms of relationships focused on. In nearly every story (except for one or two) there was some sort of romantic element between a man and a woman, which I didn’t always think was necessary. For example, the last story is about the relationship between seven identical sisters, and at the end an unnecessary romance was thrown it that I felt detracted from the emotional center of the story. Romance was definitely never the focus of any of these stories, don’t get me wrong, but I did close the book feeling like a chance to diversify in that realm was missed. I received a free pre-publication copy of this book via NetGalley in exchange for an honest review. An extraordinary collection of stories. I’d call them speculative fiction or imaginary realism. I found them highly readable. But also out of the realm of the ordinary, very unusual, creative and powerful. Unfortunately for this book, I think What It Means When a Man Falls from the Sky has set the bar for what I now expect from short story collections and this was not even close. This was really just a batch of random stories with weird concepts that ended up being unmemorable. What an interesting collection of short stories. It felt as though you were living snippets of phantasmagoric dreams, especially with the delicate style and storytelling that Sachdeva brings to the table. Yet the stories themselves aren’t delicate by any means. There is something unsettling about each story, almost like a reflection of the human mind. While these stories do not take place in the space and time with each other, I do think there are two threads that keep them together to make it a What an interesting collection of short stories. It felt as though you were living snippets of phantasmagoric dreams, especially with the delicate style and storytelling that Sachdeva brings to the table. Yet the stories themselves aren’t delicate by any means. There is something unsettling about each story, almost like a reflection of the human mind. While these stories do not take place in the space and time with each other, I do think there are two threads that keep them together to make it a fascinating short collection (which I just realized is mentioned in the blurb, but I suppose this is my desire to expand on those a little). The second theme is the feeling of isolation and loneliness. Each story features a character (or more) that are either violently ripped from their community to suffer in that space of solitude, or they come to realize that perhaps they are rather lonely but must deal with that discomfort. Sometimes it’s both.